Do you wear a wrist watch? Do you carry a pocket watch? If so, what kind? I had to buy a new watch today. Not that you care. Your last Casio calculator watch finally die? Don't confuse this with caring. I mourned when my Casio calculator watch died. Couldn't care enough to mock. Glad I'm not the last man to wear a watch, if you want to be completely honest. I still wear a Seiko. But those Casio watches were pretty tough, and readily available at any cashier location too. I have that exact watch...have had it for about 4 years. Not having a watch on my arm makes me crazy, even if I don't need to track the time. Dang. I sorta care. I know what you mean. 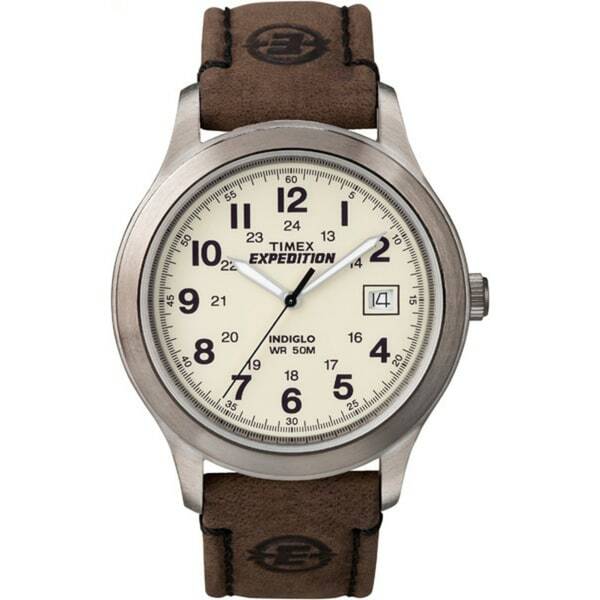 And I wear a Time Expedition as my everyday watch, too. The battery on my "dress up" watch went dead a month ago and I haven't replaced it. Where's the option for "occasionally"? I can't answer. The poll is badly drafted. I both carry and wear a watch. Usually wear. Also, what kind is none of your g-d business. Last thing I need is Goose, high on Kirkland-branded scotch and heretical tendencies, robbing my house in order to finance his shank brush purchasing habits. It's bad enough the firebug knows it's made out of wood, if you ask me. But I am doing better...no watches purchased in the last year and I actually sold 2 that I didn't wear much. It's cuz you like the digital, yes? I like watches. I'd like an Omega at some point. Maybe a birthyear Omega, or something like that. Nothing too fancy. That would be nice. Devil of an expense to keep in service, though. I hesitate to answer for fear of allegations that I am hip. I ordinarily wear a 1950s Wittnauer (no Longines involved, thanks) with a manual mechanical movement. It's not shock-proof or waterproof, so I do not wear it when I know I will be very active or possibly caught unprepared in a downpour (after all, who takes an umbrella to a honky tonk?). It's an antique. The rear is engraved, "Don Messick, Bolckow, Mo." It was a birthday gift from my better half, and it means a great deal to me. That's no hipster watch. That's a fine timepiece. Have you found a good watchmaker you'd like to share? I wear the Timex Expedition daily, and a not terribly expensive but more formal, rectangular, gold-tone dress watch by Lotus (now decades old and no longer in their catalogue) for more formal events. As I haven't attended a formal event in a while, the battery on my "dress watch" that went dead over the summer hasn't yet been replaced. We have a watch repair shop in town. The man who runs it replaces watch batteries for the cost of the battery. 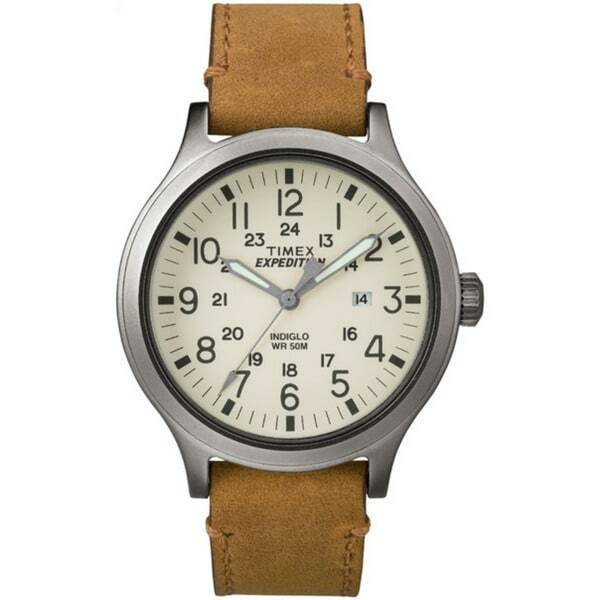 This is the exact model I bought: Timex Men's TW4B065009J Expedition Scout 43 Tan Leather Strap Watch. I bought it for $41 at Wal-Fart. I like the light-up dial. You just gave me a sad. I no longer carry a pocket knife, useful thing that it is, because of metal detectors in the courthouses. I only own one watch. Its a really nice one and was my father-in-law's. I still love timex watches. They do take a licking and keep on ticking. I haven't. The neighborhood jeweler is good enough for a tune up. My local place is authorized to repair many brands, but will only repair modern models and want anything old to go to the company that made it. That's nice unless you have a Longines pocket watch worth about 40 bucks that isn't worth sending back to Longines. Every time I wear a vest or waist coat. I have an open backed 23 jeweled movement pocket watch, b*****s.